At Andy’s appointment with the orthopedic doctor (following his serious bike wreck ten days ago), we learned that, while most collar bone fractures heal on their own, his was more severe. We scheduled surgery to screw a titanium plate to his clavicle the very next day. It was supposed to last 1 – 1.5 hours, but went 2.5 hours, because the break was (according to the surgeon) “pretty nasty.” And instead of it being a same-day procedure, Andy was kept overnight, due to low post-op oxygen saturation plus high pain levels. It was a stressful situation. I don’t like seeing my Sweet Man hurt. It’s hard to feel so powerless to help. But thanks to the wonder of the internet, we didn’t have to go through it alone. We’ve been comforted by the support of family & friends, who’ve not only sent well wishes, but have purchased hat gift certificates and hat kits. And we’ve been touched by the caring of relative strangers, who blogged and tweeted concern for our plight, asking others to spread the word. Thank you all. So much. It means the world to us. 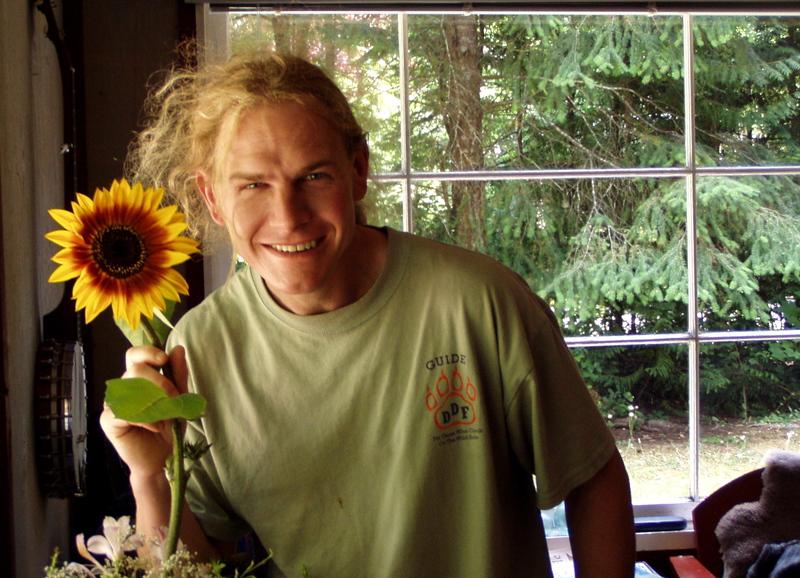 Andy with organic sunflower grown on Gabriola Island, BC, July 2003. And to the friends who’ve fed us, lent us your shower (Andy was in the midst of redoing our upstairs bathroom before his accident), and come to help fix our plumbing – We owe you. Big time. This entry was posted in Family, Life and tagged collar bone injury, compound clavicle fracture, gratitude, hubba hubby by Carrie Cahill Mulligan. Bookmark the permalink. I’m so glad that he’s home and safe. Here’s to a speedy and full recovery! Hear, hear! Now that the plate is in, we’re both relieved. Healing will happen much faster, now. Thanks for your well-wishes, Somer! Andy we are sending you healing energy and hope you got some good painkillers. And I got an email from FRED! It is easy for me to understand why all of the love is coming your way, my friend…..it is because of all of the good and positive energy and common goodness you send out to the universe on a daily basis….you and Andy are such decent and wonderful people, Cary…..it is all coming back to you…..
We are so grateful. Thank you, hanahula!